Ocean View Maui Condo Right Across from the Beach! 1 of 6 larger MK condos. Kindly consider our beautiful, spacious ocean-view Maui Kamaole condo, located on the sunny side of the island. We fell in love with Maui the first time we visited and we have been going back often ever since. This gorgeous, newly-remodeled, air-conditioned condo is one of only six 1244 square-foot condos at Maui Kamaole! All other ground-floor condos are 850 to 1061 square feet. You can really tell the difference in the living room, which nearly twice as big as other 1-bedroom condos. The condo has two newly-remodeled bath rooms, new flooring, a newly-tiled private lanai with ocean-view & a private sunning porch off the bedroom. There is a comfortable, new king sized bed in the bedroom & a queen sized sofa bed with new, comfy inflatable mattress in the living room. Two single fold-out cushion-style 'futons' & a fold-up playpen/crib are also available. A 40' new HD flat screen LED TV with swivel mount can be viewed from anywhere in the living room and even from the lanai. The recently-remodeled kitchen is fully equipped with a microwave, garbage disposal, range, oven, new dishwasher, blender, new refrigerator and freezer plus all the dishes & utensils you will need. Barbecue grills are available at both pools & outside the condo. For your convenience and enjoyment, the unit has a washer and dryer, 2 flat-screen TVs, free wifi (high speed & wireless Internet), DVD/CD player with bluetooth and phone with answering machine. Beach towels, beach chairs, coolers & boogie boards are all available for guest use, so pack light--this condo has everything you need! The air-conditioned condo is right across from the Kamaole III Beach Park & within walking distance of many shops and restaurants in Kihei and Wailea. Kamaole Beach was voted Kihei's top beach. Two sparkling pools and spas are available for your pleasure. Maui Kamaole is on the far south end of Kihei, right next to Wailea. Hi-rise buildings are not allowed on this side of the island. The condo is in a quiet area, so you will not be kept awake at night by noise and music from bars, restaurants or night owls that condos in central Kihei experience. World-class, ocean-front golf courses are located nearby. Maui Kamaole has its own tennis courts on-site for your use. There are also public courts in Kihei. You can snorkel & dive in reefs & lava flows all along the coast in front of the condo. Turtles are EVERYWHERE! Learn to surf or stand-up paddle board at the Cove right in Kihei or drive to Paia or Hana to experience the big surf of the North Shore. Hike through thick bamboo forests with cascading waterfalls into fresh-water pools or take in the sunrise, sunset or moonscape at Haleakala National Park (reservations required for sunrise). Walk the ocean-front path that begins at the boat ramp in front of the condos & enjoy seasonal (winter/early spring) whale watching right from shore. The path stretches from the condo in South Kihei all along the beaches and Wailea resorts and ends at Polo Beach in Makena. Or simply relax at the condo and enjoy your own slice of Paradise. From the condo lanai (patio), we have watched whales breaching, boats sailing and outrigger canoeists paddling. The beautiful Wailea Resorts & Shopping Village are nearby. Kihei has supermarkets, shops and restaurants, as well as a Farmer's Market selling local fruit and crafts. There are local grocery stores in Kihei plus Costco, a new Target, Wal-Mart and K-Mart near the airport. You will find excellent restaurants near the condo and all over the island. The resort hotels offer several gourmet restaurants. Or barbecue at the pool or condo during Happy Hour sunsets & enjoy peaceful meals on the condo lanai. Whatever you choose to do, or not do, you will love this spacious, beautiful, newly-remodeled, tropically decorated condo. Please contact me if you have questions or would like to book the condo. PS-For a video of the condo & surrounding area, scroll through the photos till the end or click on the link below 'Owner Information'. Our condo, when available, is discounted off CRH published rates. All rates are subject to state taxes. Payment of 50% of your total is due upon booking, with the balance due 60 days before your arrival. Deposit less $350 is refundable if canceled 60 days or more before arrival; less $500, 30-59 days; less 4 nights rent, 0-29 days. Exception: Christmas bookings. Bookings 12/16 to 1/6 require full payment due by 10/15 & are non-refundable unless condo can be re-rented. Prices are subject to change without notice. Additional person $12; over standard occupancy (2). Check in 3PM; check out 11 AM. Our Hawaii Business License Tax # is TA # W40853500-01. We wanted to be on the sunny side of the island, away from the high-rise hotels and rainy weather in Kanaapali/Lahaina. The beaches in South Kihei and Wailea are some of the best on the island (See Maui Revealed--a great visitors' guide to the island). We enjoy being close to restaurants and shops without being in a noisy city. We enjoy the snorkeling, boogie-boarding, surfing and whale watching right in Kihei and Wailea. We love the tropical pool, sand-bottom jacuzzi and on-site tennis courts. And we adore being in a quiet, ground floor condo with a lawn and beautiful view of the ocean and West Maui Mountains. We have looked at, owned and stayed in other condos, and ours is truly the nicest and most spacious we have seen in Kihei. We are fortunate to have bought one of only 6 ground-floor Maui Kamaole condos with the larger floor plan. Ours has as much square footage as the MK 2-bedroom condos and, because of the large, ground-floor lanai and lawn, actually offers MORE space than the 2-bedroom units! The sofa-sleeper (with new, comfy inflatable mattress) and cushion-style 'futons' provide more sleeping spaces, so Maui Kamaole I-117 was a no-brainer. Because Maui Kamaole has its own artesian well, the grounds are lush, tropical and immaculate. We love the morning calm. Just as the day begins to warm up in the afternoon, tropical breezes begin blowing to cool us off. We leave the windows open most of the time and rarely use the air-conditioning. The south end of Kihei is peaceful and quiet, yet within walking distance of shops and restaurants. We really feel like this is paradise. The best part of our condo is the view, the spaciousness, the privacy and the location. We love waking up to a beautiful ocean view and taking walks along the beaches. We often see whales right from shore, and even from our own lanai in the winter and early spring. While we're drinking coffee and eating papayas on the lanai, the birds come begging for bread crumbs. Mornings are great for beaching it so we spend many hours snorkeling, boogie boarding, whale watching, body surfing, surfing and diving right in front of Maui Kamaole and all along the coast. Afternoons are for adventures--hiking to waterfalls, exploring the Haleakala crater, sea kayaking, tennis or golf. Shopping at the island-style boutiques and open markets is fun, too! Then it's happy hour on the lanai and barbecuing at the pool, bidding farewell to the sun with a blow of the conch shell as it sinks into the ocean (watch for the green flash), enjoying delicious island food in the condo and settling in for an early slumber so we can do it all over again the next day. We owned Maui Kamaole condos in the A and G buildings and have stayed in other Kihei condos, but we enjoyed the larger floor plan, spacious living room, gorgeous view and quiet privacy at MK I-117, so we kept this one and sold the others. We recently learned that I-117 is one of only six 1-bedroom Maui Kamaole condos with this larger floor plan. It has 1244 square feet, which is as big as the 2-bedroom condos at Maui Kamaole! The ground-floor lanai and expansive lawn creates even more space to enjoy, which is perfect for our extended family. In October of 2015, we remodeled the kitchen and both bathrooms. They turned out beautiful, with quartz and quartzite countertops and mahogany cabinets. In December of this year, we will replace the flooring in the living room and bedroom. We can't wait to share it with you! Newly remodeled master bath is attached to the bedroom and has a full tub and shower. Guest bathroom has a shower. Just installed Verde Veccio quartzite counter in hallway bathroom and new countertop and vessel sink in master bathroom. Tropical decor and local art add to charm in bathrooms and throughout condo. The gorgeous ocean view also includes the beautiful West Maui Mountains. The ocean view from I-117 is gorgeous. Check out the photos. Your view will not be marred by telephone wires, parking lot, street, etc. Plenty of linens for king bed, queen sofa-sleeper & cushion-style futons. Pack light! The washer/dryer is right in the unit. Both washer and dryer are right in the condo. Free parking in your own designated spot (I-9) right outside the condo door. Free wireless Internet (WiFi) is available for guest use. Bath and beach towels are provided for guest use. Largest ocean-view living room we have seen in a Kihei condo - perfect for relaxing or entertaining. The extra square footage is most noticeable in the huge, square living room with new flooring. We leave spices & non-perishable condiments in the cupboard for your convenience. Kitchen is fully stocked with all the dishes and utensils you will need. We leave non-perishable spices in the cupboards for guest use. Newly remodeled kitchen has quartz countertops, mahogany cabinets and is fully equipped with new dishwasher, all major appliances, blender, dishes, utensils, pots, pans and basic spices. Inside dining area and lanai dining area both have ocean views. The large living room with new flooring & large tiled lanai are great for entertaining. 9 guests can be seated at tables, inside & out! 40' flat screen HD LED TV with swivel mount in living room. Flat screen TV in bedroom. New stereo with Bluetooth and aux cord for your music plus CD player and radio. New DVD player and bluetooth connection. Library in closet for guest use. 'Maui Revealed' tour book available for guests. Please sign our guest book, too! Lush garden area and lawn in front of the ocean-view lanai expand the footprint of this already spacious condo. Watch whales November through March and gorgeous sunsets over the ocean year-round. Newly tiled & furnished ocean-view lanai just off living room is great for drinking coffee, toasting sunsets and seasonal whale watching. Patio has brand new table with 4 chairs and 2 lounge chairs. We leave several boogie boards and other beach, pool and ocean gear (beach towels/backpack beach chairs/coolers/etc.) in the condo closet for guest use. Check the closets before you buy anything. On-site tennis courts are free and available for guest use. Sign up the day before for guaranteed no-waiting or walk up and play whenever courts are free. Public courts and a tennis club also nearby. World class, ocean-view and ocean-front golf courses are a short drive from the condo. There are a few steps to get into the condo door. The condo does not have a ramp. The condo is on the ground floor. 2 gorgeous, sparkling outdoor pools, surrounded by palm trees & tropical vegetation. Both have grills & jacuzzis. Pristine, sparkling hot tubs are available at both Maui Kamaole pools. The hot tub at the tropical upper pool has a sand bottom. Pack light because this condo provides just about everything you will need to enjoy the island Paradise of Maui. We leave beach gear like towels, coolers, boogie boards, backpack beach chairs, sand toys, etc. in the closet for guest use. 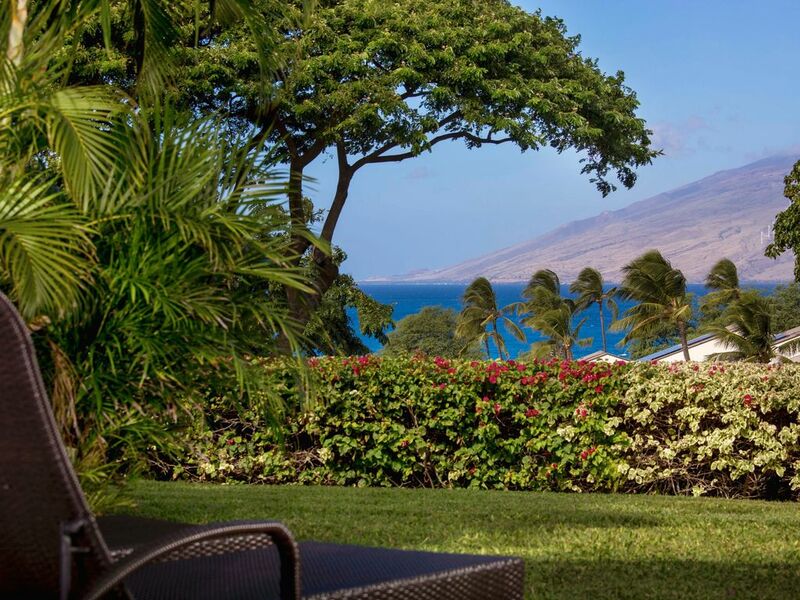 Enjoy the ocean-front walking path with seasonal (winter & early spring) whale watching that stretches from in front of the condo through Wailea and all the way to Makena. Hiking, mountain biking, zip lining, helicopter rides, sailing, cruises, an aquarium, world-class resorts and breathtaking views are all available for you enjoyment. The daily temperature doesn't vary much from 76-89 degrees, year round. A hat, sunglasses, swim suit, shorts, sun dress, sarong, sandals, light jacket/sweater/sweatshirt for evenings, sunscreen and a few t-shirts are about all you will need. We joke that you could arrive in Maui with nothing but a bit of cash & find everything you need at the ABC (convenience) store near the condo. Aloha! Maui Kamaole was the perfect stay for us in Maui! Staying in a condo on Maui is the way to go! Having a washer/dryer, a full kitchen, 2 bathrooms, plus all the amenities really made it feel comfortable. We were able to use beach chairs, boogie boards and beach umbrellas that were stored there for our use. We enjoyed walking on the beach at sunset, driving up Haleakala volcano, snorkeling at Molokini crater, driving the road to Hana, and even tried paddle boarding. We will always remember how special our stay was. Thank you to the Sandmires, we really enjoyed our stay! The unit was clean comfortable and convenient to grab things for the beach to go. Parking right outside the door was handy, everything we needed was there. Missing it already! My family had an awesome vacation at Sam's condo. We were so glad we decided to stay at a vrbo instead of a small hotel room. We felt like we were at home while on vacation. This place is a must stay if your considering it. Mahalo for taking the time to write a review. We are so glad you enjoyed Maui & the condo. Hope you got to snorkel as the turtles love to hang out at the coastline just down from the condo. Glad you were able to spread out & feel at home. Hope you can return soon. Aloha! Perfect location and Fabulous View! This Maui condo is the best location because it's close to everything! We even took a Redline Raft snorkel excursion and the meeting place was right across the street early in the morning- it was perfect. You can walk or go running through the tree covered hills of Wailea, and there is one of our favorite Kamaole beaches right across the street. The place was clean and offers two great swimming pools and hot tubs. We hope to return soon! Thanks so much for taking the time to write a review. We’re glad you enjoyed the location. It is one of the many reason we chose to keep this condo. It is in a quiet area, but with excellent proximity to the beaches. Condos in the middle of Kihei do not share the peace and quiet of our condo on South Kihei, yet it’s just a short walk to restaurants, bars & shops. Thanks again for reviewing the condo. So glad you enjoyed your stay. This property is spacious. It was clean and the kitchen was well stocked. The view of the ocean from the lanai was wonderful. The bed was comfortable The furniture, bed linens and bath towels are dated, however. It is showing its age and would benefit from a general updating. The condo complex is not within easy walking distance to the Kamaole III beach. It is directly across from the Kihei boat launch. However it is a short drive to the beach and parking was generally easy to find. It is a quiet property, the parking slot is closely situated to the condo, which is a nice benefit. Mahalo Kathleen for taking the time to write a review. I am glad you enjoyed the clean condo, the ocean view, the comfy bed, convenient parking, and the clean, quiet condo with well-stocked kitchen. I am heading to the condo next week to do some remodeling, including new flooring, new linens/towels/etc. I get there once or twice a year, so it is good to hear what needs replacing. I will update the condo site with new photos when the remodel is complete. We always walk to Kamaole III Beach Park so last time I was there, I counted & it was just under 300 of my steps. We keep "backpack" beach chairs with pouches for towels, etc. in the closets for guest use. Thanks again for taking the time to review the condo. We appreciate you! Thank you so much for being such wonderful guests and for taking the time to write a review. I leave in 10 days to go replace the carpet with beautiful flooring and I can't wait! Glad you enjoyed the condo, lawn, bed, lanai, etc. Thanks for your patience and understanding. We would LOVE to have you back any time in the future! Please call Sam at 208-859-0560 for current rates. We often run deeply discounted specials for fill-in dates. Rates are subject to change until booking occurs. Value season generally runs April 21-Dec. 21 and Winter season runs Dec. 21-April 20. If you want a guaranteed late checkout, the cost is half a night of lodging and must be arranged with Sam.